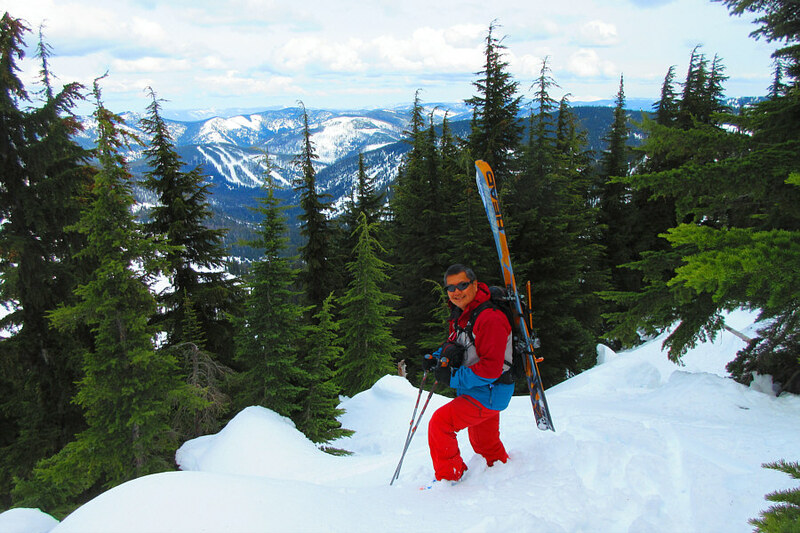 On 24 March 2019, Zosia Zgolak and I completed a ski ascent of Stevens Peak located in the Bitterroot Mountains about 90 kilometres east of Coeur d'Alene, Idaho. 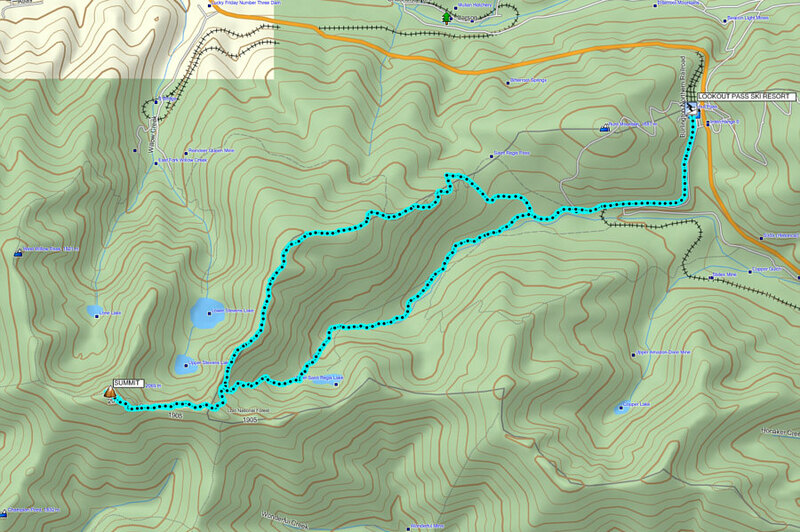 Several ascent routes are described in Summitpost.org, but while researching the area with Google Earth, I spotted what I thought was another feasible route via the northeastern branch of the peak's east ridge. This northeastern branch runs along the Idaho-Montana border, and in Google Earth, it appears to be quite straightforward to follow. Of course, the danger of using Google Earth is that it does not always capture smaller terrain features accurately, and Zosia and I would eventually find that out the hard way. 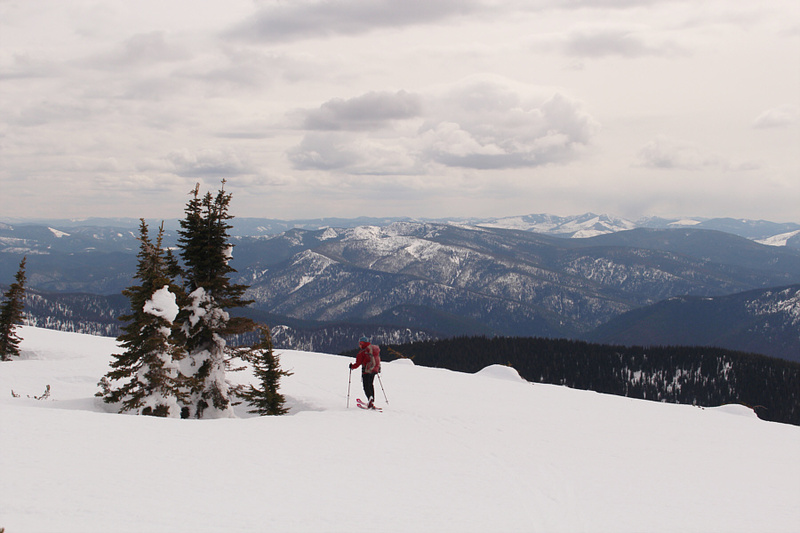 Had I also read the Summitpost.org descriptions more closely, I would have noticed that my chosen ridge is mentioned briefly with the added caveat, "only extremely experienced skiers should consider this route." Blissfully unaware of the difficulties that awaited us, Zosia and I started our trip from the parking lot for Lookout Pass Ski Area located beside the I-90 on the Idaho-Montana border. 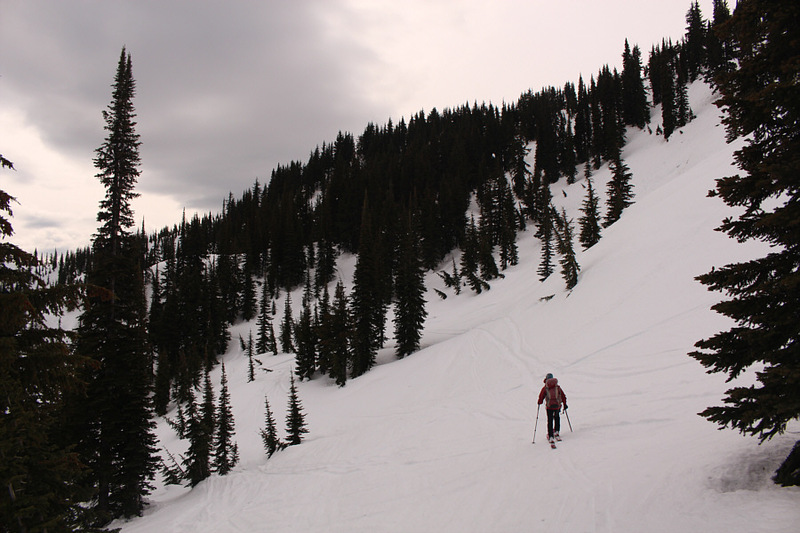 We began skiing on a groomed snowmobile track which follows an old railway right-of-way southward for about a kilometre before turning westward for another kilometre. Had we known that this first section is slightly downhill, we would have left our skins off at the parking lot to enjoy a faster glide all the way to the back side of the ski area. Just before the railway right-of-way loops back to the I-90, we took a road branching to the right and soon passed the bottom of Timber Wolf chairlift. 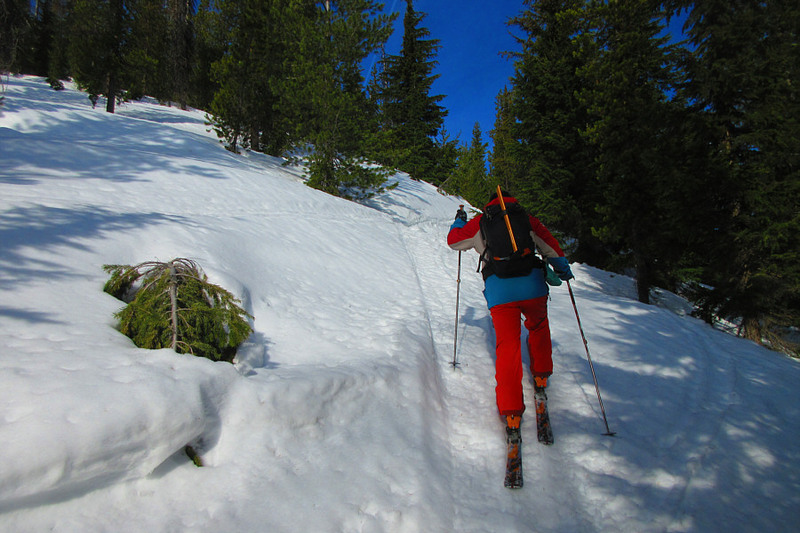 We briefly skirted the edge of the ski area boundary until we spotted another obvious track heading westward into the forest. We followed this track to a wide road which appeared to be heavily used by snowmobilers, and this road would lead us up to the crest of our ascent ridge (northeastern branch). 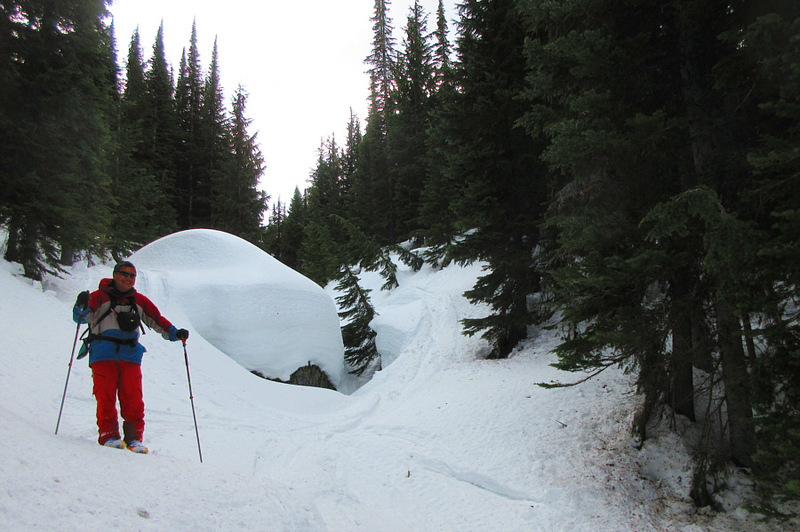 Sonny accesses the old railway right-of-way from the parking lot of Lookout Pass Ski & Recreation Area. The trip starts with a gentle descent for about two kilometres along the old railway right-of-way. 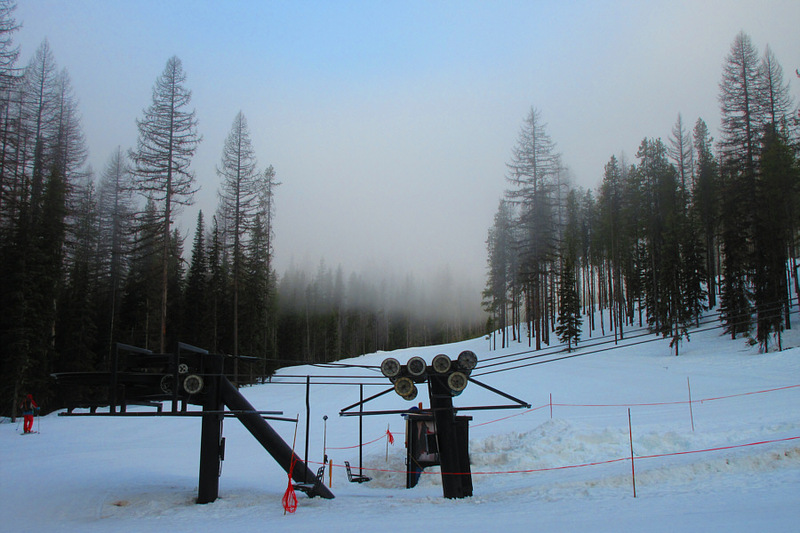 Sonny passes by the bottom of Timber Wolf chairlift in the southwest corner of the ski resort. 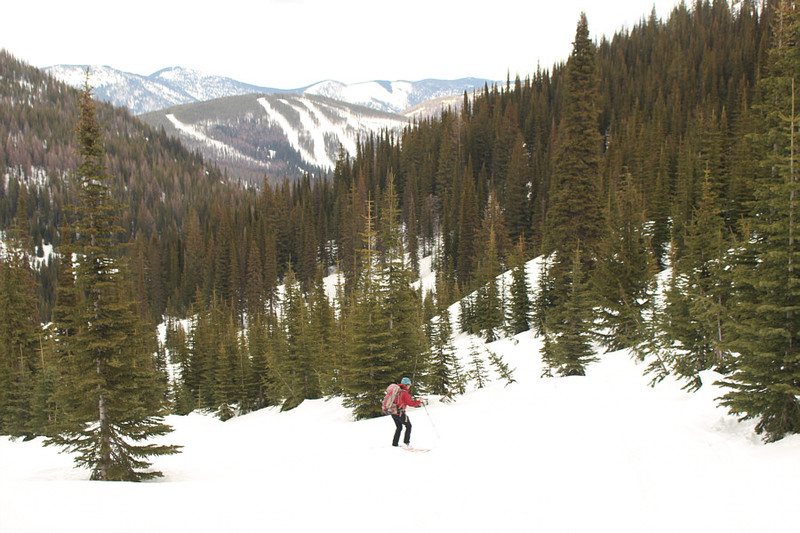 Zosia follows a wide snowmobile track that leads to the ridge on the state border. Zosia and I had no problems climbing up this ridge until the last few hundred metres where it intersects Stevens Peak's east ridge. Here, the northeastern branch narrows considerably and is guarded by some rather intimidating pinnacles that would be challenging to hike let alone ski. The failure of Google Earth became abundantly clear here, and the warning which I had neglected to heed in summitpost.org was also evidently warranted. Still, I was not about to give up so easily, and I tried to traverse below the ridge crest in an attempt to circumvent the pinnacles. Zosia reluctantly followed me, but we ended up on an uncomfortably steep slope which only got steeper the closer we approached Stevens Peak's east ridge. Although I felt confident about snow stability, I could see that gaining the east ridge this way would have put us in increasingly exposed terrain which was not an appealing prospect. 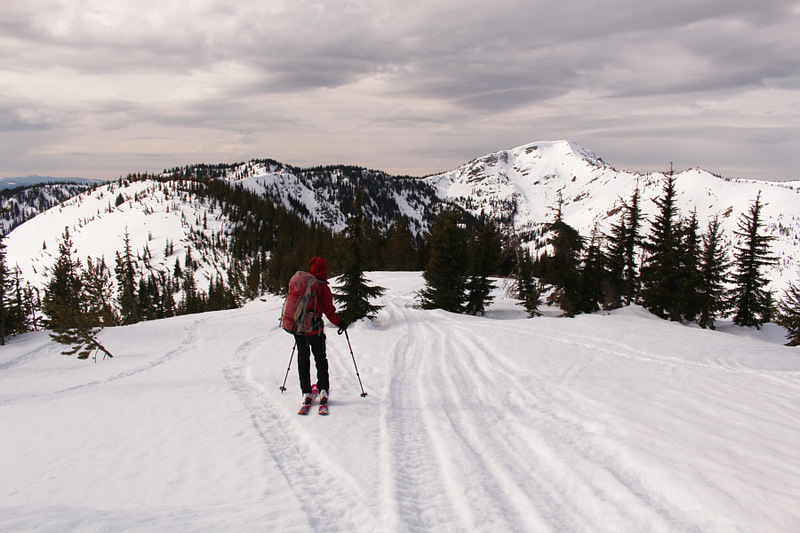 Instead, we bailed on the traverse and dropped down with some difficulty into upper St. Regis Lakes basin. We almost pulled the plug on the ascent at this point, but after taking a short break, we decided to give the headwall at the back of the basin a try. 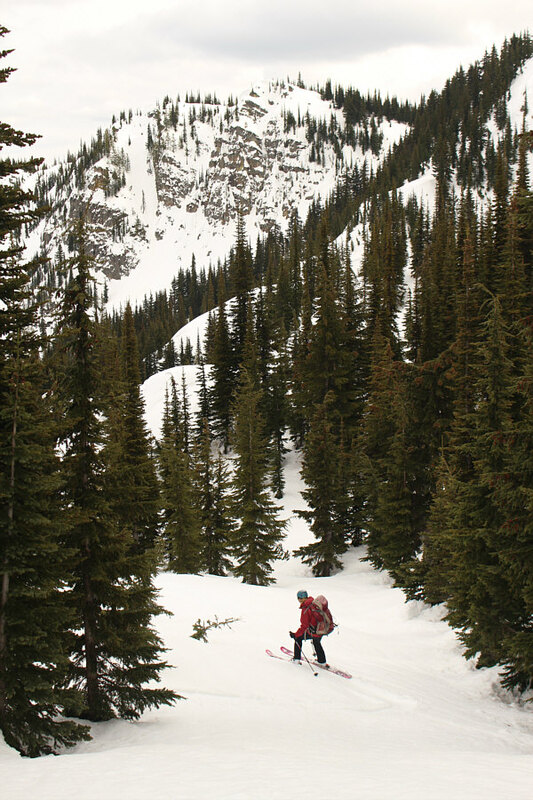 The terrain here is just as steep as that on our aborted traverse, but the abundance of trees made the headwall feel less exposed. 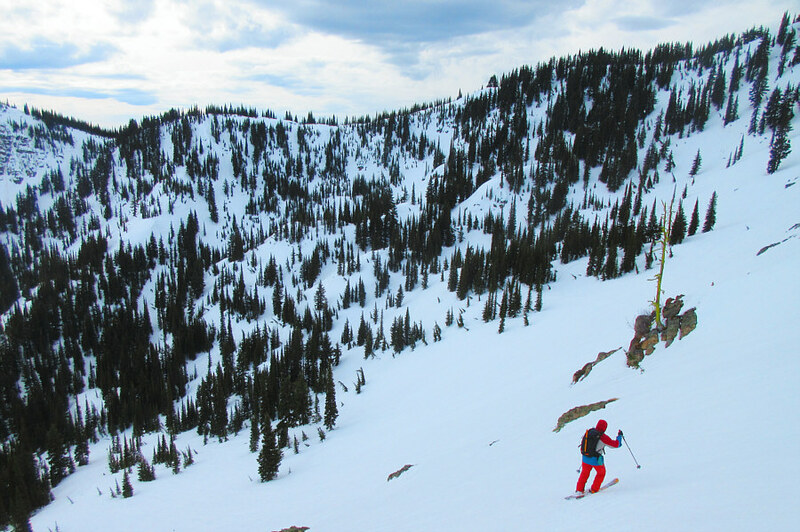 As such, we climbed with greater confidence, and although we had to resort to boot-packing when the slope became too steep to skin up, our persistence paid off when we finally crested the east ridge of Stevens Peak. 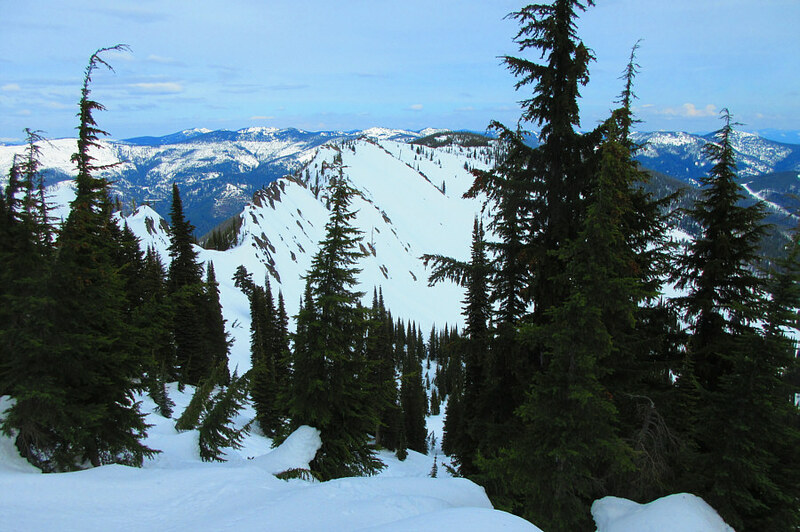 From there, we turned westward and dropped down a slight dip in the ridge before breaking out of the trees onto open south-facing slopes. We finished the ascent with an easy uphill plod. 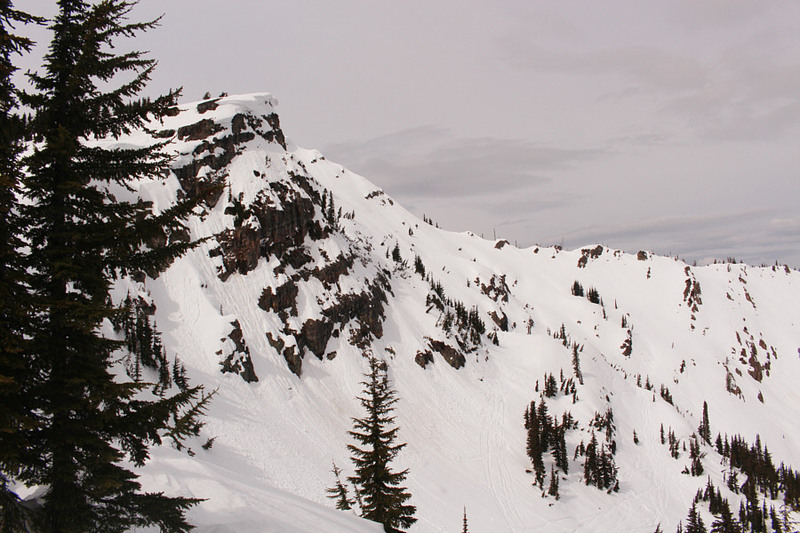 Although the snowmobile tracks are nice to follow on the ridge, the snow is supportive enough on this day to allow for easy travel. Sonny grinds his way up one of the steeper sections of the ridge. Zosia gets her first glimpse of Stevens Peak in the distance. 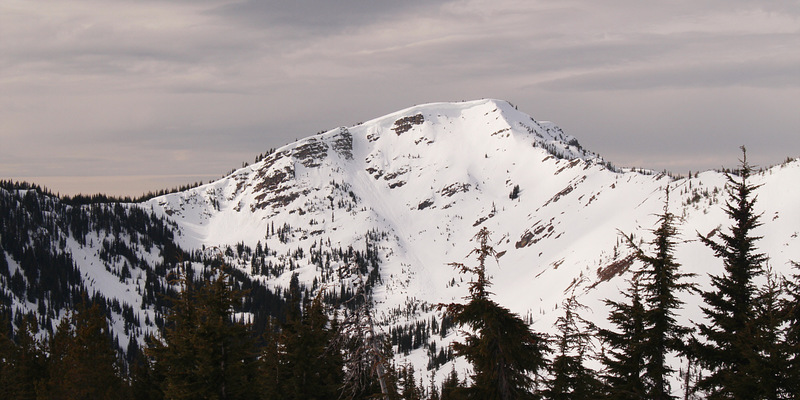 Here is a closer look at Stevens Peak. The ridge narrows forcing Zosia to descend an uncomfortably steep slope. The slope that Sonny is descending is steeper than it looks here. 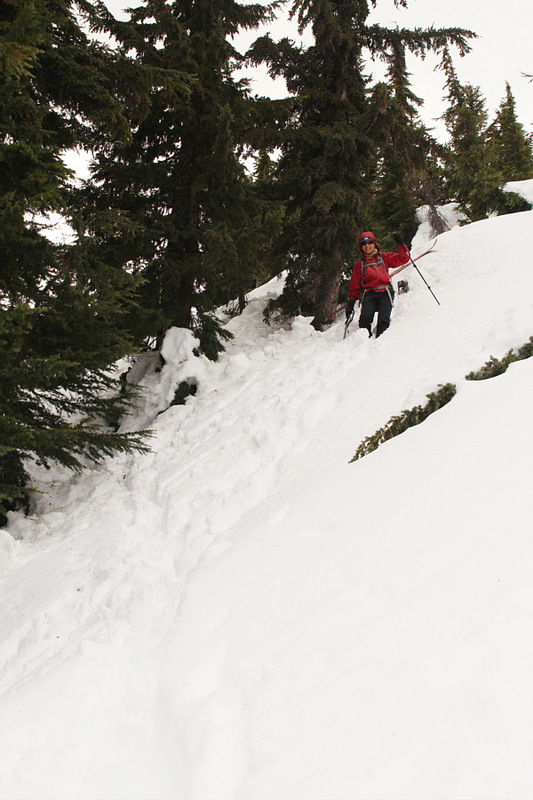 Zosia finds herself on safer ground after a harrowing descent off the ridge behind her. Zosia continues up the slope looking for a weakness to gain the ridge. 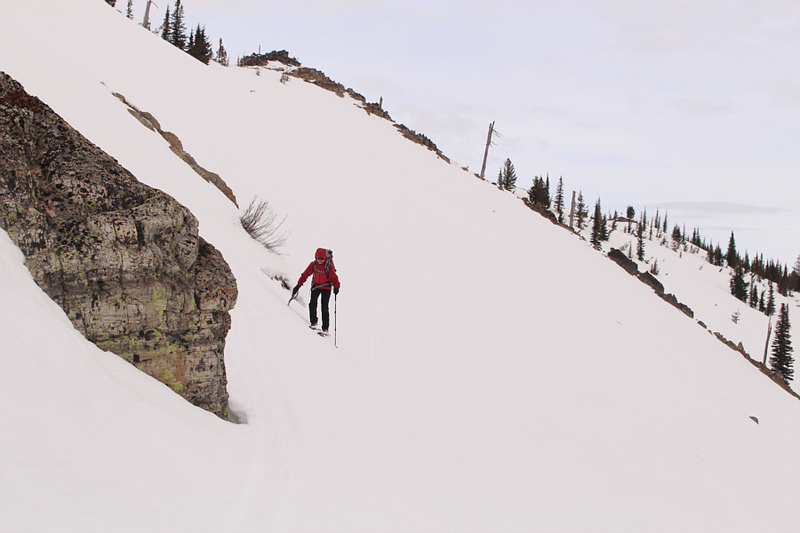 Some skier down-tracks hold some promise for gaining the ridge, but the terrain is uncompromisingly steep. 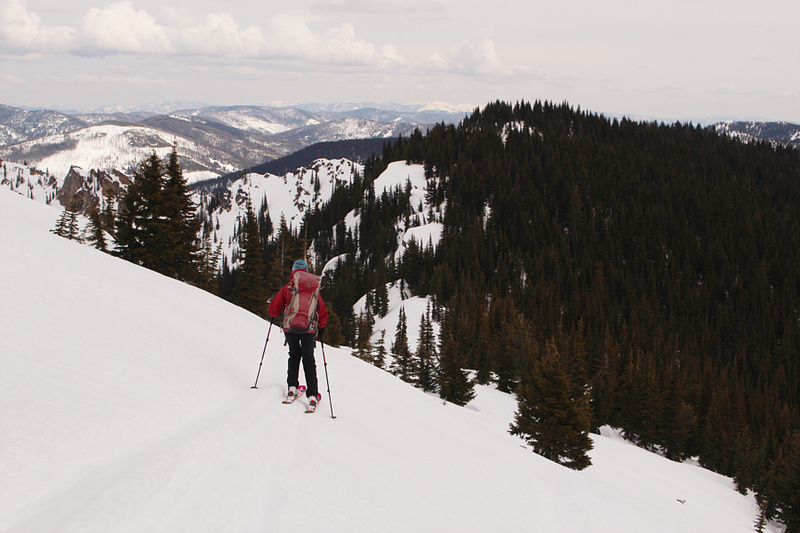 Zosia finds it easier to carry her skis and boot-pack up the slope to gain the ridge. Here is a good look through the trees at the pinnacles that forced Sonny and Zosia to abandon their approach along the ridge. 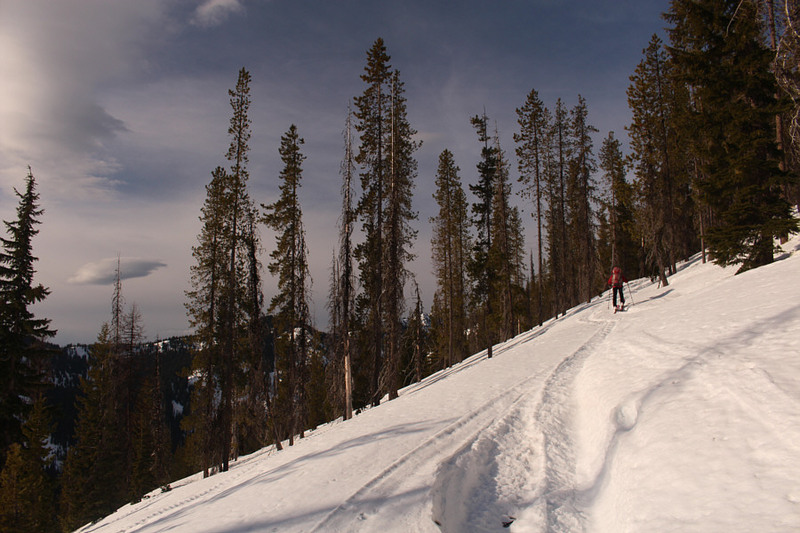 A break in the trees along the east ridge grants this view of Stevens Peak's precipitous north face. Note the ski tracks below the face. 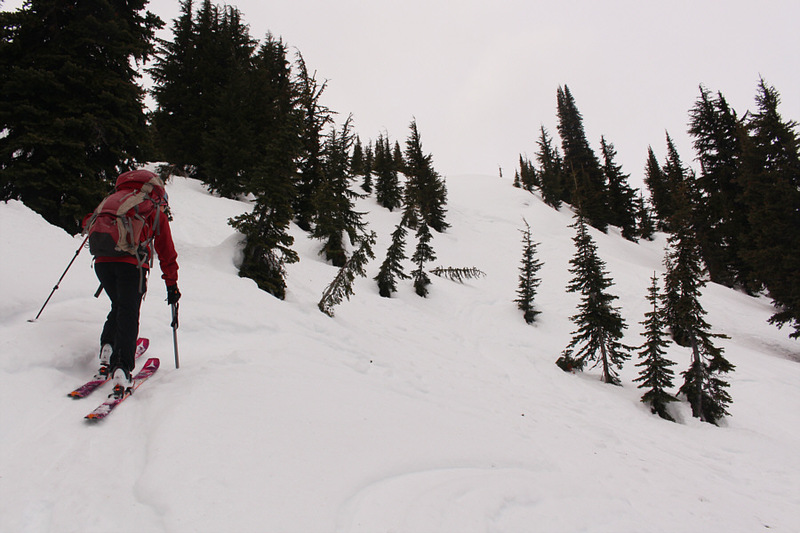 Zosia ascends the gentler south slopes of Stevens Peak. 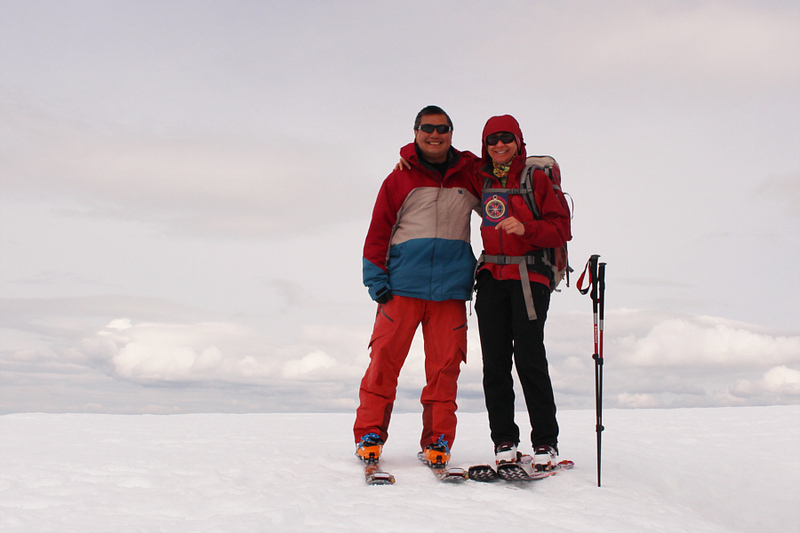 Sonny and Zosia reach the summit of Stevens Peak (2081 metres). After taking another short break on the summit, Zosia and I kept our skins on and retraced our steps back to the headwall above St. Regis Lakes basin. 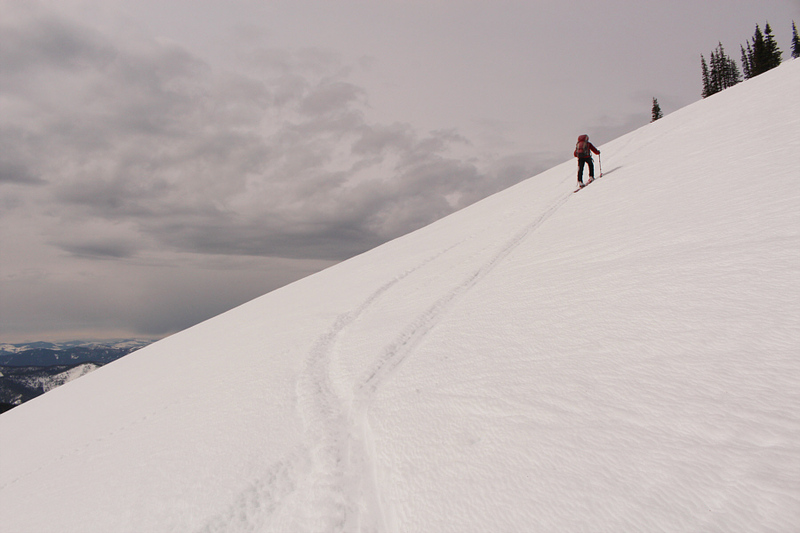 Had we more time and energy, I might have considered yo-yo skiing the open south-facing slopes below the summit. 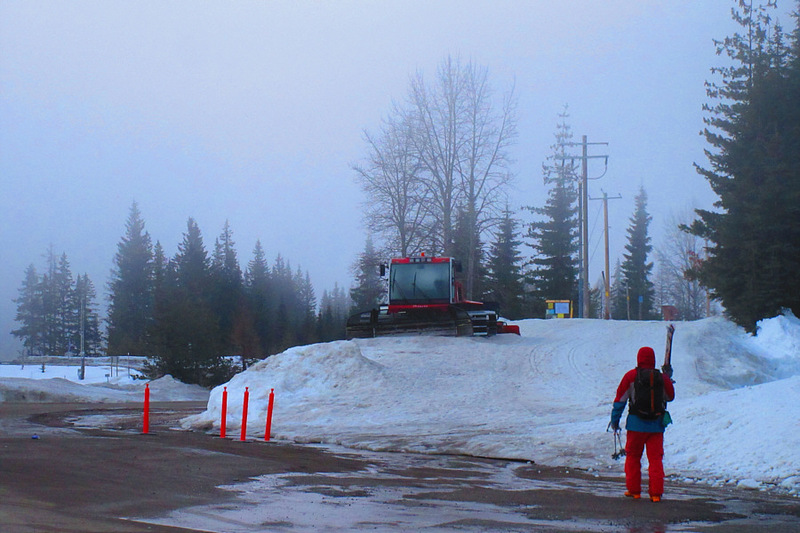 However, the day was starting to get late, and we still had a long haul ahead of us getting back to the ski resort. 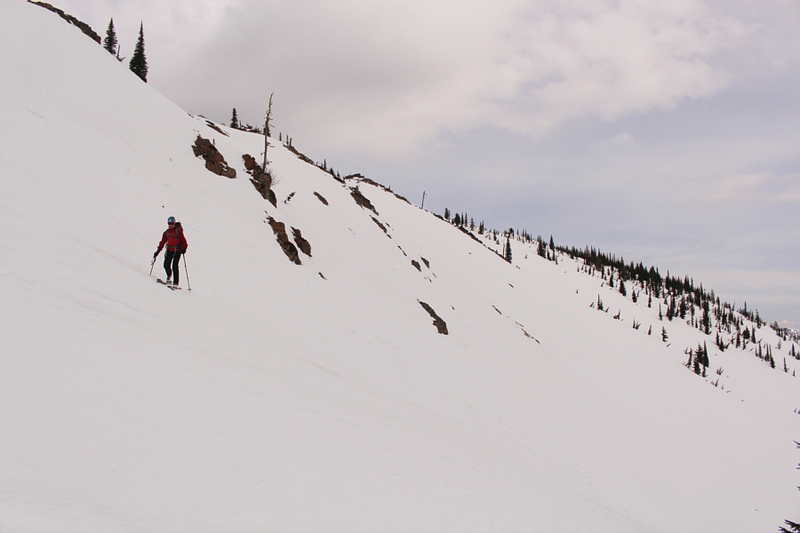 At the top of the headwall, we chose to hump our skis again and walk down the steepest sections until we reached more comfortable terrain for skiing. 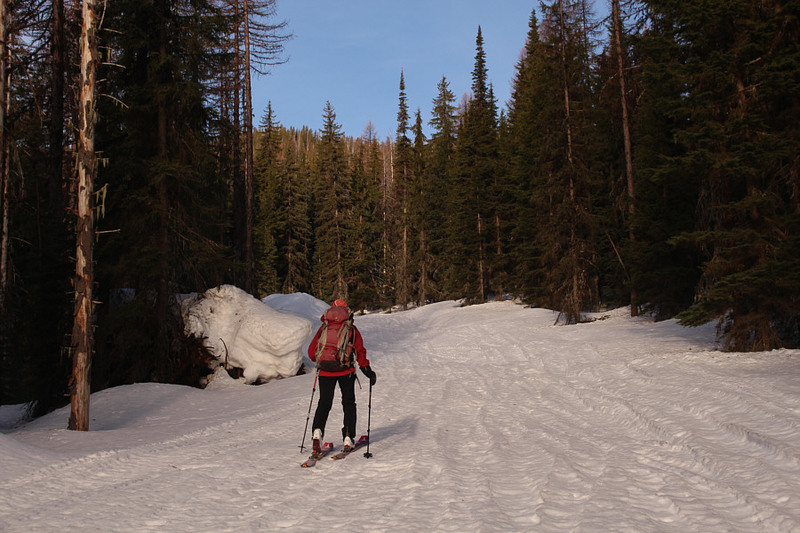 The ski out St. Regis River valley was a bit of an adventure. 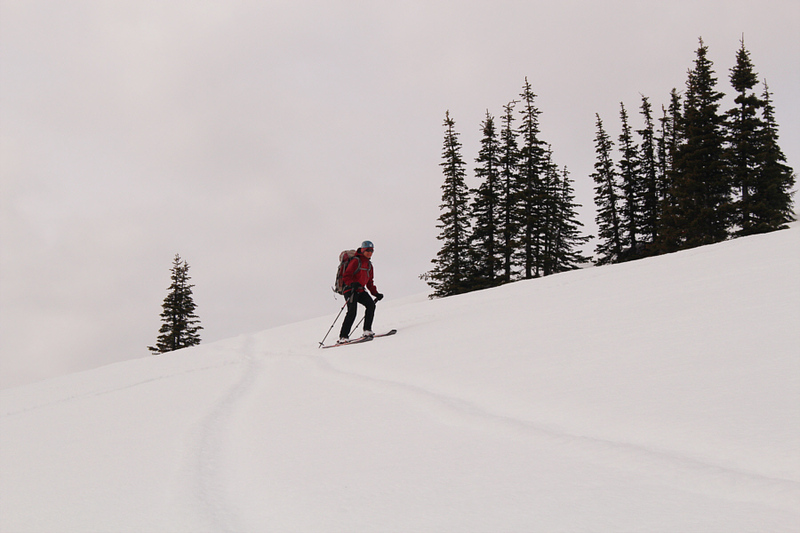 There were plenty of old tracks and flagging to follow out the valley, but often, these were not the most pleasant routes to ski. Snow conditions also deteriorated as we progressed, and it generally seemed difficult to maintain any sort of momentum even though we were going mostly downhill. I felt some relief when we finally left the valley behind us and gained our up-track not far from the ski resort. By the time we returned to the bottom of Timber Wolf chairlift though, the ski resort had already closed killing any hopes we may have had in catching a ride and skiing back down to the parking lot. Instead, we settled into an easy but annoyingly long uphill shuffle along the railway right-of-way to get back to my car. We subsequently drove to Coeur d'Alene and stopped at a Denny's for dinner to celebrate our accomplishment and Zosia's birthday. From there, we continued driving for a few more hours to reach Kennewick, Washington where we ultimately checked into a comfortable hotel for the night. Zosia leaves the summit and starts the return journey. 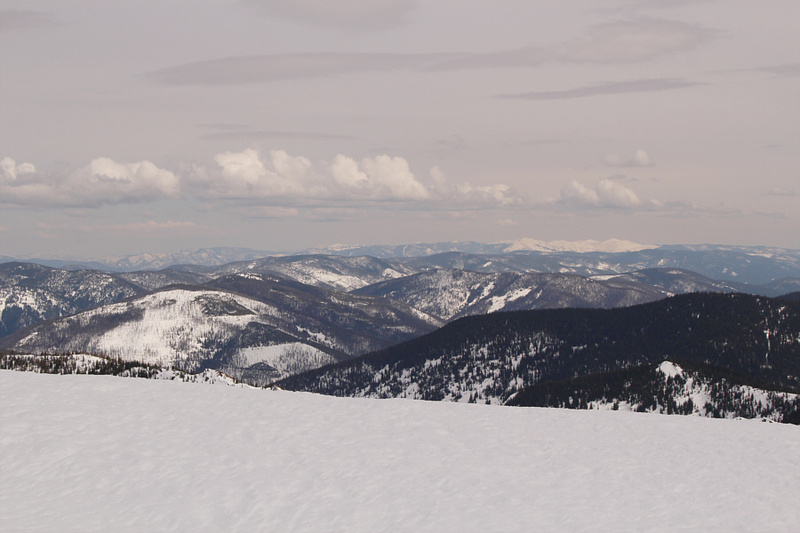 The patch of white on the right horizon is in the vicinity of Cherry Peak about 46 kilometres away to the east. Zosia makes her way down the open slopes below the summit. Zosia carefully descends to a dip in the east ridge. 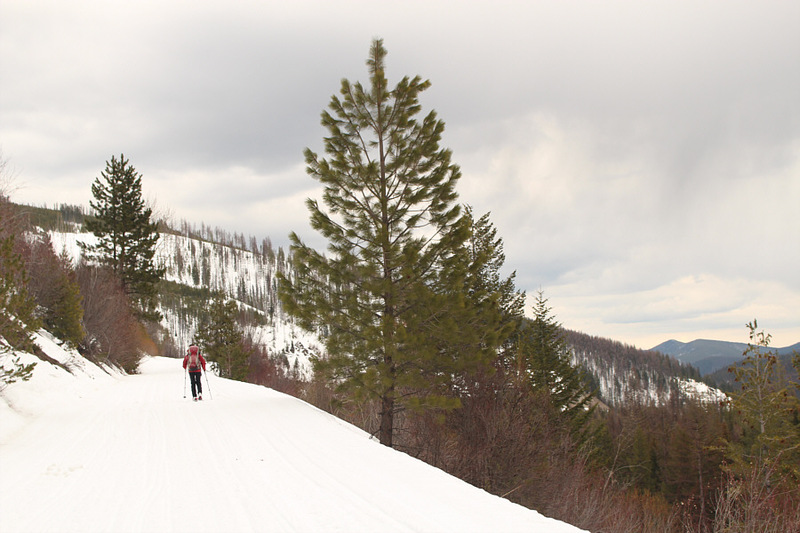 Sonny is not too proud to hump his skis and walk down a slope that he finds too steep to ski. Zosia plunge-steps down the steep slope below the ridge crest. 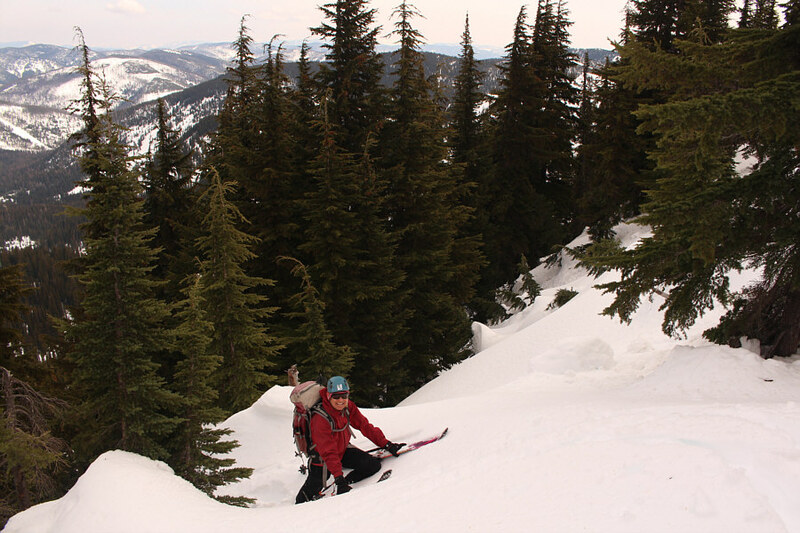 Back on more moderate terrain, Zosia resumes skiing through the trees. 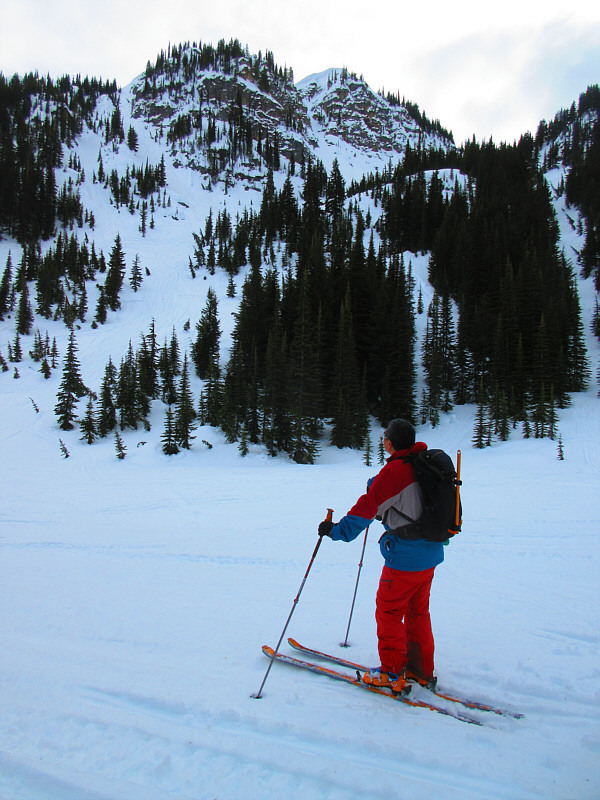 At Upper Saint Regis Lake, Sonny spots a ramp that is probably the usual access to Stevens Peak's east ridge. The ski out along Saint Regis River valley has a few tricky spots such as this one; the hole between the rock and the tree is alarmingly deep. 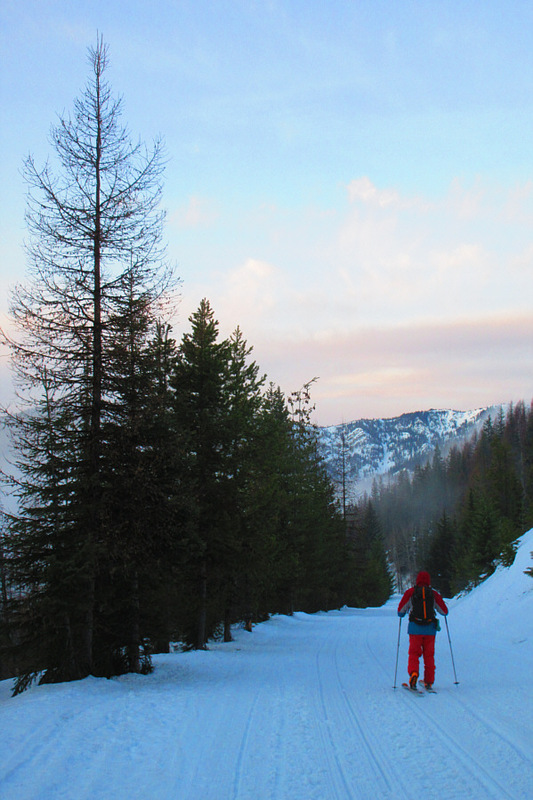 With part of the ski resort visible in the distance, Zosia continues to muddle along Saint Regis River valley. Zosia finishes the trip with a very gradual ascent of the old railway right-of-way. 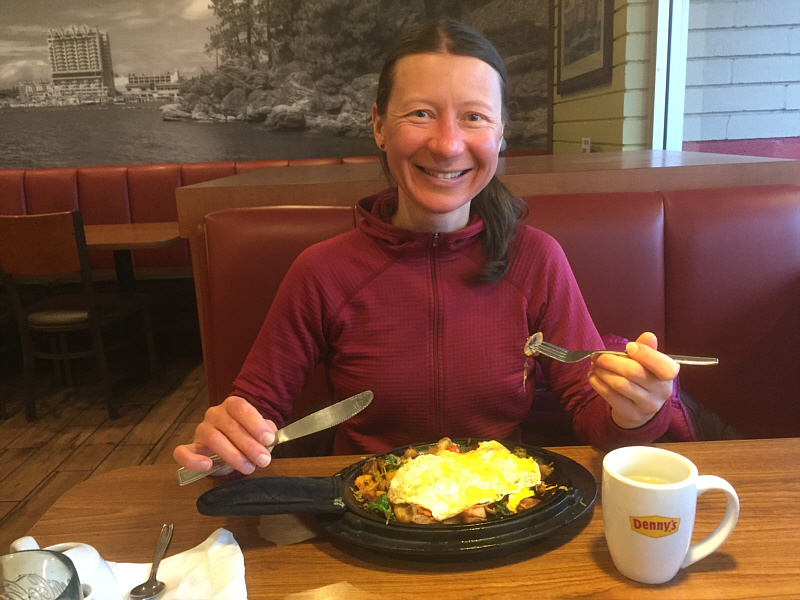 Zosia enjoys a free birthday dinner at Denny's in Coeur d'Alene.